Joe Said So: Think You Have Nothing to Blog About? Think Again. Think You Have Nothing to Blog About? Think Again. My father has been an organic gardener for over twenty-five years and has won dozens of awards for his fruits and vegetables. He's truly gifted at what he does; so gifted that last year, his entire crop of veggies was stolen in the middle of the night. He's that good. While my dad was crop-less and bored, I encouraged him to start a gardening blog. After all, with twenty-five years of tips and techniques under his belt, coming up with content wouldn't be very hard. Also, he'd have no trouble finding an audience, especially as people continue to endure economic hardships and become more and more health conscious. After some convincing he finally caved and PlaysintheDirt.net was born. Now he's as much of a rock star online as he is in the yard. He posts regularly and keeps his content fresh. 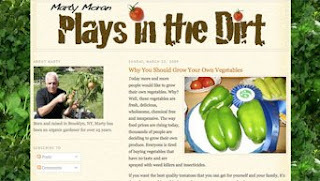 My mom even guest blogs with homegrown recipes. It's adorable. It's fun. It's relevant. Believe it or not, someone out there wants to hear what you have to say. Seriously. Think about it. There's an audience for just about anything on the Internet. In fact, the more obscure your topic the better as it will likely mean less competition. Whether you're writing about a hobby, a talent, or just giving your opinion about something, you want to be passionate and honest in your blogging. Remember, your own personal flair is what's going to separate you from everyone else. WordPress is the industry standard when it comes to professional blogging but there are a slew of blogging services to choose from including (but not limited to) Blogger, LiveJournal, Tumblr, and TypePad. Blogger is my platform of choice as it is free, fully customizable, and integrates well with other Google services (it is owned by Google). However, it's all a matter of personal preference. Just pick one and go with it! What sets a blog apart from a static web site is that it opens a dialogue between the writer and the reader. That said, when someone leaves a comment on your blog, be sure to reply! By engaging in conversation, you develop a relationship with your audience and create loyalty amongst your readers. Loyal readers will come back for more - and they'll likely bring their friends! Once you have a steady stream of traffic on your blog, you may want to explore making some money off your ramblings. While there are a lot of creative ways to earn an income from your blog (from sponsors to affiliate links to selling merch), two of the easiest methods are through Google AdSense and the Amazon Kindle Store. Google AdSense displays relevant ads on your blog based on your content (so readers are more likely to click on the ads), while the Amazon Kindle Store offers e-book junkies the opportunity to pay for a monthly subscription to your content. Both services are free and relatively painless to set up. Joe Says: So, what's it gonna be? What ideas have you been sitting on? Be creative! Post your thoughts in the comments. I'm interested to hear what you have to say!